I’ve been away for a whole month now and wow it’s flown by! Now my Myanmar group tour is over and I won’t have such a busy, hectic travel schedule I’m going to try and post a weekly blog update with a travel update, a few personal notes and anything I’m loving on social / entertainment wise. Let me know what you’d like to see, and if you’re enjoying / not enjoying the updates! Since I last shared a travel diary, I’ve had the most amazing two weeks in Myanmar. A country that’s only been open to tourism since 2012, our tour group has been welcomed with open arms, warm smiles and a greeting of Mingalarbar. We put down our chopsticks (fork and spoon is more common here), grabbed a longyi and were thrown temple first into Myanmar’s rich history and culture. The first week was spent travelling a lot, mostly to pagodas, temples and stupas. A pagoda is the term for the full Buddhist site, a temple you can go inside and the stupa is the (often gold) tower which you cannot enter. Temples and stupas can live alone too and both can be referred to as pagodas. Top Tip: when visiting temples you have to cover your shoulders and knees, and take off you shoes. I recommend either midi dresses or long loose pants and a t-shirt. Sandals make your life easier taking your shoes on and off if you’re visiting a few in one day. 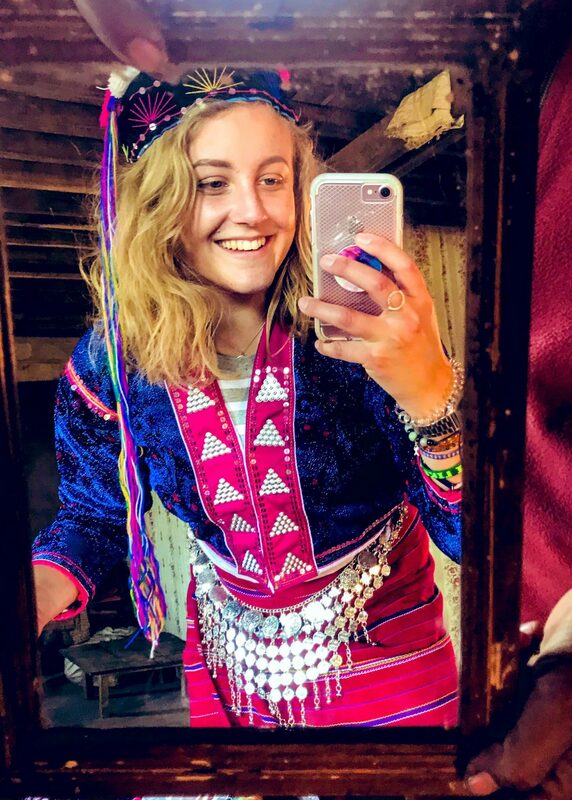 Traditional Myanmar dress is a Longyi, a long wrapped skirt which goes down to your ankles – easy to pop on over shorts or a shorter skirt and available for a reasonable price (up to a fiver or so) literally everywhere you go! 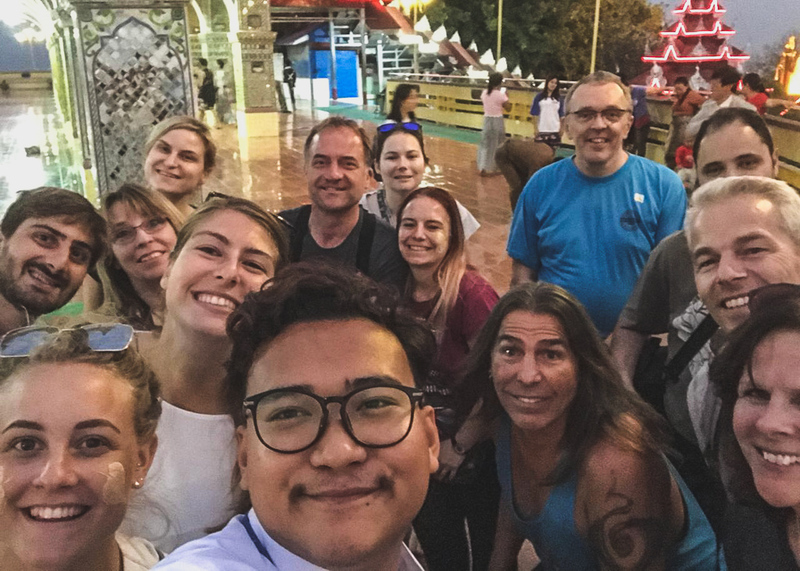 Our journey across the country took us from the previous capital Yangon, up to Kin Pun to one of the most famous Myanmar Buddhist pilgrimage spots, Kyaiktiyo Pagoda. Next stop was Mandalay, where we visited a lot of beautiful temples and took a boat to Min Gun. We flew to Bagan and spent two days exploring temples, experiencing the sunrise and sunset and of course looking out in awe at the beautiful hot air balloons. 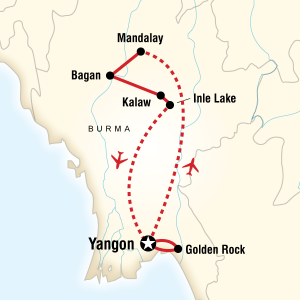 Next, a bus to Kalaw and hiked the mountains there, followed by an exciting, swaying train ride to Inle Lake. An amazing day on the lake wizzing across the water visiting local handicrafts and experiencing the wind in our hair. Back to Yangon for a final explore downtown before we said danced the night away, said our goodbyes and went our separate ways! Some of the group have onward travel and some are back to work. We had an awesome international mixture from Sweden, Canada, Italy, Switzerland, UK, Portugal and New Zealand. 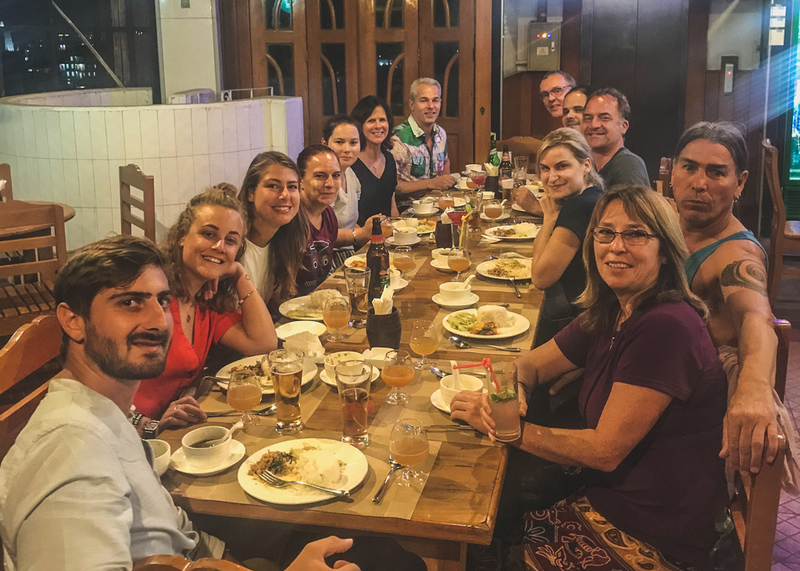 A few couples, a few solo travellers and all sorts of ages has made for an awesome and diverse trip with plenty of laughs, rum sours and longyis along the way. Whilst I’ve been having a lot of fun exploring with the group, in the background I’ve been thinking a lot about my family and my Grandma. It was her funeral on Friday and my dad had asked me to write something short to be read out, to give me a part in the day despite my absence. It wasn’t easy and it took a lot of thinking, re-writing and editing before I was happy. Going to find my own way to say goodbye whilst I’m here. Love to all my family during this strange time in our lives ♥️. 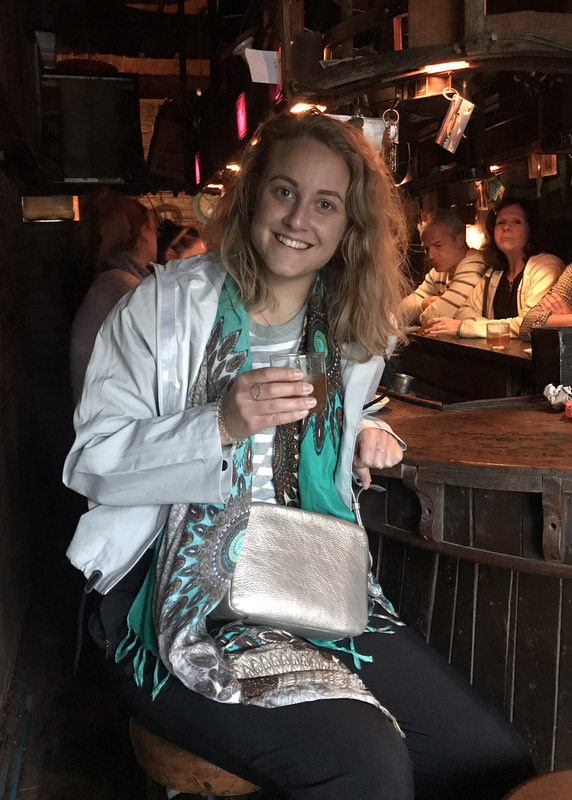 Social – Been chatting to a couple of other solo travel girls on instagram, shout out to Laura and Kayla who are smashing their travels too. Check out their instagram pages for their journeys. Also, enjoying World Trippin’s vlogs and interviews, and Sarah who I met in Chiang Mai a food photographer has a page full of gorgeous dark tones and great pics. Shout out to Lisa (grabyourcam) for some lovely blog feedback, and Catherine (Vintage Frills) for sharing my instagram link with other bloggers! Podcasts – haven’t listened to too many recently but I did make time for Em Jo Real-Davies latest cast in her contraception series. This time about the app “Natural Cycles”, interviewing the company themselves and then two women who used the app to no avail. Learn more about this controversial alternative by listening here. Also, so glad the High Low podcast is back, their latest episode is 90mins and jam packed with awesome book and reading recommendations. Music – as always, Sigrid and Tove Lo are on my “recently listened”, but a new addition is the Spider-Man Soundtrack, particularly loving “Memories” by Thutmose. So that’s the latest from South East Asia. Today I’m in Ngapali Beach which is on the west coast of Myanmar. Planning to have some chill time after a hectic couple of weeks exploring, and of course time to write up all my adventures and experiences for here!